Samurai Sudoku puzzles are a great what to put yourself out there and dare yourself to achieve something that you have never done before. 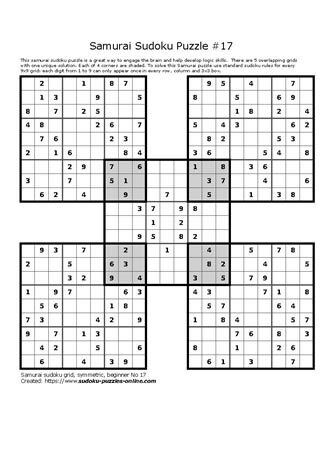 Puzzles support brain health and with these forms of extreme Sudoku puzzles, they are sure to give the brain a great workout. Use Sudoku's basic rules to solve the puzzle to help solve this interconnected series of five 9x9 grids.